Pop star chills with NBA side ahead of their season-opener on Wednesday against the Bulls. 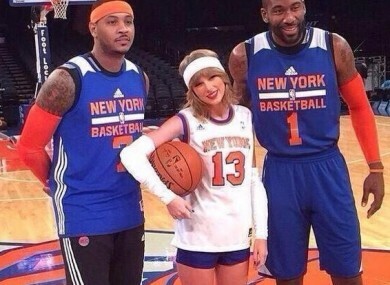 Taylor Swift with an unimpressed Carmelo and a beaming Amar'e Stoudemire. THE NEW YORK KNICKS get their NBA season started on Wednesday with a game against the Chicago Bulls at Madison Square Garden. The team got in some practice over the weekend and invited some famous faces to join them for a scrimmage, including pop starlet Taylor Swift. Posing for photos with a couple of the team, the singer looked to be enjoying herself a lot more than Carmelo Anthony, who seemed a bit underwhelmed by the whole thing. Still, Amar’e Stoudemire looked well-pleased. For all those basketball hipsters out there, Swift is wearing a #13 Knicks shirt – synonymous with Mark Jackson, point-guard with the team between 1987 and 1992. Unsurprisingly given the Knicks’ failure to reach the post-season last term, there was plenty of banter greeting the photo once it did the rounds on social media. This was probably the best. Email “Taylor Swift shows her support for the Knicks and hangs out with a less-than impressed Carmelo ”. Feedback on “Taylor Swift shows her support for the Knicks and hangs out with a less-than impressed Carmelo ”.